Can’t get enough of Vegas or Macau? Apart from getting professional help so that you don’t sink deeper into the pit of uncontrolled gambling, there is another way out for those who still feel that they can battle it out on their own. 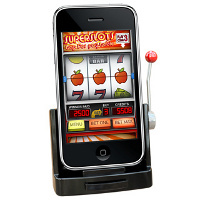 We’re talking about the £29.99 iPhone Jackpot Slots, where you are required to provide the iPhone for yourself first before getting started on some portable one-armed bandit goodness. This is definitely an iPhone/iPod touch dock with a difference, where it will dock, charge and sync your Apple device in style while offering the semblance of a mini Vegas-style slot machine. It isn’t just for show, you know, since the lever is fully working and will play nice with an included app. In-game credits can be won so that you unlock further slot games that have their very own difficulty levels, ensuring that you will never run bored at the office and end up in a Nerf gun fight.